UNION, New Jersey (WABC) -- A company based in Union, New Jersey, is recalling nearly 4,000 pounds of bologna products due to misbranding, undeclared allergens and ingredients that weren't properly inspected. 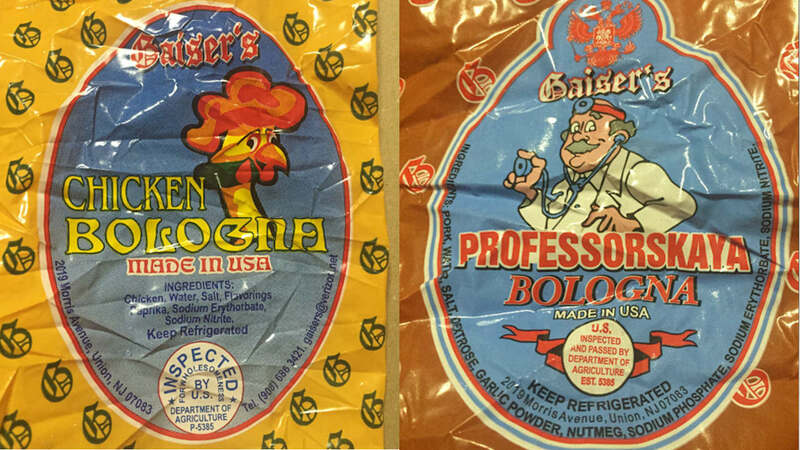 Gaiser's European Style Provision, Inc., announced the recall of approximately 3,895 pounds of chicken and pork bologna, which may contain nonfat dry milk, a known allergen that is not declared on the finished product label. --1 pound chubb artificial casing containing "Gaiser's Russian Brand Professorskaya Bologna" pork bologna with various packaging dates from Oct. 10, 2016 to Oct. 21, 2016. --10 pound chubb artificial casing containing "Gaiser's Professorskaya" pork bologna with various packaging dates from Oct. 10, 2016 to Oct. 21, 2016. --1 pound chubb artificial casing containing "NetCost Market Professorskaya Brand Bologna" with various packaging dates from Oct. 10, 2016 to Oct. 21, 2016. --1 pound chubb artificial casing containing "Gaiser's Chicken Bologna" with various packaging dates from Oct. 10, 2016 to Oct. 21, 2016. --3 pound chubb artificial casing containing "Gaiser's Chicken Bologna" with various packaging dates from Oct. 10, 2016 to Oct. 21, 2016. --1 pound chubb artificial casing containing "NetCost Market Chicken Bologna" with various packaging dates from Oct. 10, 2016 to Oct. 21, 2016. The products subject to recall bear establishment number "EST. 5385 or P-5385" inside the USDA mark of inspection. These items were shipped to retail locations and/or for institutional use in California, Minnesota, New Jersey, New York and Washington. The problem was discovered during a Food Safety Assessment. There have been no confirmed reports of illness or adverse reactions due to consumption of these products. Anyone concerned about an injury or illness should contact a healthcare provider. For more information, CLICK HERE. Consumers with questions about the recall can contact Gaiser's European Style Provision Inc.'s plant manager at (908) 686-3421.